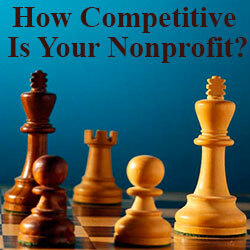 How Competitive Is Your Nonprofit? Nonprofits are typically assessed by a variety of objective and subjective criteria including i) financial evaluation of the sources and amounts of monies raised together with the share of donations that are consumed by fundraising, administrative and marketing expenses, ii) the degree to which an organization is accountable and transparent to its donors and other stakeholders, iii) the tangible results achieved in pursuit of an organization’s mission, and iv) the impressions created by highly visible activities such as affiliations with businesses and public figures. As important as all of these are, another measure that is not generally applied to nonprofits is their degree of competitiveness. Unlike for-profit enterprises who vie for customers, nonprofits compete for resources in the form of donations, grants, in-kind gifts, etc. A nonprofit’s competitiveness is equal to the value that benefactors believe will accrue to them as a consequence of their gifts. The specific value desired will vary among supporters, but will generally involve a combination of i) Feeling confident that the organization’s mission is important and that they’ve chosen the organization most capable of achieving the stated objectives, and ii) Expectation of tangible direct benefit, usually in the form of enhanced public perception or social status, that can be gained by making the gift. Together, these form the expected return on “investment” (of time, cash, or other resources). This is more than just an academic question. Competitiveness matters. The fact is that there have never been more nonprofits battling for finite, or even declining, resources than there are today. According to The Urban Institute, the number of US nonprofits increased 25 percent, from 1.25 million in 2001 to 1.57 million in 2011. At the same time, we’ve seen stagnant real disposable personal income and, businesses, even those that want to be good corporate citizens and who understand the need to appeal to a generation of more socially conscious consumers, are under increasing pressure to maximize profitability and justify every expenditure. The net effect is a shrinking pie from which only the most competitive organizations, those that offer the greatest “return” to donors, will get the resources they need. So, is your nonprofit sufficiently competitive to attract the personal and corporate gifts that fuel the pursuit of your mission? The way I see it, albeit for different reasons, nonprofits and businesses are actually working to achieve two of the same objectives: positive public awareness and “sales.” For the nonprofit, “sales” translates into the acquisition of human (i.e., volunteers) and economic capital and other critical resources, while businesses pursue sales in the traditional sense. Expressed another way, despite the fact that nonprofits’ ultimate mission is to address specific problems or issues, and businesses strive to maximize profitability, the means (positive awareness and sales) to these very different ends are similar. By joining forces in the pursuit of their common means, their respective ends can be achieved; solving social problems and maximizing corporate profits, respectively. In assessing different strategies of donor (be it corporate or consumer) outreach, nonprofits should consider their competitive condition and the value of the return they are offering. Nonprofits and business have been working together for years in a number of ways. One common archetype for these affiliations is making the ask for economic and/or in-kind support in exchange for corporate bragging points expected to elevate a company’s public image. While this does offer businesses a return in the form of PR and tax benefits, it doesn’t directly help them achieve their bottom line objectives. We also frequently see sales-dependent donation campaigns in which the sale of a product unlocks a donation for a designated organization. Although this type of campaign does align with consumer interest in “conscious consumption” and does drive sales for business, it comes with a few challenges. First, since it prioritizes product over cause and requires the consumer to make a purchase in order to affect some good, it can result in consumer cynicism particularly with respect to the business’s true motivations. This can be exacerbated when it isn’t clear exactly how much of the purchase price will go to the nonprofit beneficiary. Moreover, commercial co-venture laws can impose regulatory hurdles for business. Donation drives are also very popular, ubiquitous fixtures of the brick and mortar checkout counter. Large nonprofits like Children’s Miracle Network Hospitals have demonstrated that this type of donation solicitation can be highly effective. In fact, they report an impressive 40% donation rate! However, if business does not make matching donations or put some skin in the game in a way that’s readily visible to consumers, it can be perceived as an empty, half-hearted effort. Moreover, asking people to give in front of other customers can result in feeling pressured which can contribute to donor burnout. I’d argue that it’s not the most positive way to make people feel good about being generous to your cause over the long term. So, with limited resources and changing economics and demographics, I believe that there is a need to re-engineer these archetypes in favor of a model that more completely, and measurably, aligns the needs and objectives of three parties: nonprofits, businesses, and consumers. Success will increasingly depend on the degree to which a program reverberates with the public in their roles as donors and volunteers for nonprofits and customers for business. Although giving can be its own reward, both businesses and consumers need to see that there is a more tangible return. Effective, mutually beneficial cause marketing programs need to be designed in such a way that they incentivize both giving and spending; simultaneously motivating people to act both as both donors and good customers. For consumers, the return can be getting thanked (preferably, in full view of their friends and family in social media), being rewarded with a sample of a company’s product or service (or a discount on it), or gaining access to some exclusive content (e.g., music downloads, videos, images, documents, apps, etc.) that positively reinforces business and nonprofit branding at a low marginal cost. Other proven factors affecting public interest include donation matching, brand/cause fit, and choice. People respond better when the initiator offers to match donations….the sense that we are all in this together can be highly motivating. The extent to which the business and charity seem to make sense together, the more the public perceives that the company has the expertise to be particularly effective in helping the nonprofit be successful. Finally, empowering consumers to choose either the nonprofit, or the project to which their donations are earmarked, they are likely to feel a greater sense of control over the donation process which can result in higher participation rates. According to a Cone Media study, 94% of people say they want to do business with companies that are socially responsible, or give back in some way but only 16% believe that business has actually made positive impact on social and environmental issues. These numbers demonstrate a huge opportunity. The more your nonprofit can help businesses engage their customers around their good works in a way that positively affects their bottom line, the more competitive you’ll be in this challenging environment. We developed Charitable Checkout’s ‘Rewarded Giving’ cause marketing platform to embody these principles and enable businesses to measurably and profitably connect with consumers around shared values. We make it easy for businesses of all sizes to create campaigns that benefit whatever charities they happen to support while enhancing their corporate image and driving customer retention, acquisition, and sales. When consumers give to a business-endorsed cause using Charitable Checkout, they automatically receive redeemable rewards like coupons, and are thanked publicly via social media. Moreover, all the financial and regulatory functions are seamlessly handled in the background by the platform. Charitable Checkout can simultaneously drive sales for your corporate partners while generating social media awareness and donations for your organization. The businesses that run Charitable Checkout campaigns cover the platform license costs…and we never touch the donations. A Basic Subscription costs your business supporters just $9.99 per month and we even offer them 15-day free-trial. Jay Ziskrout is the Founder & CEO of Charitable Checkout. Having worked for years helping major brands engage consumers through music and entertainment (as COO of CMJ Network), he decided to pursue his vision for connecting businesses with consumers around shared values. A former performing musician and international music industry executive come tech entrepreneur, Jay previously served as Founder of LatinoVision.com, Managing Director of Epitaph Records Europe and VP Promotion for Arista/BMG.